This article shall help the manufacturing and quality assurance personnel to identify and eliminate the chipping problem of the tablets. Innovations in tablet manufacturing have seen the dawn of machine operations in the manufacture of tablets. While it would have been thought that the machines would produce perfect tablets, but that is far from the truth. Chipping is the breaking of the edges of the tablet during the manufacturing process and for chipping to occur it can be perceived that the tablet has to have already assumed its form. Chipping can occur as the tablet leaves the press, at the instant when the tablet forms, or during subsequent operations such as coating. 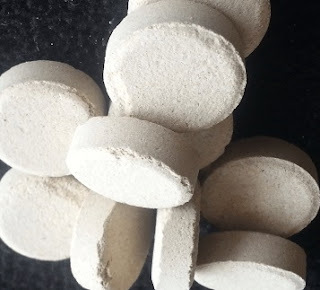 The causes and remedies of chipping in tablet manufacturing can be categorically divided into two; tablet press causes and formulation/granulation causes. At this instance, It would be wise to note that while some of the causes and remedies to tablet manufacturing defects may seem similar especially those that relate to the formulation, the flaws are unique in occurrence, sharing only in the causes and remedies. For instance, binding and chipping seem to have a close relationship from the perspective of the formulation. Now, chipping could occur by the tablet sticking to the punch face, which could be as a result of poor lubrication, or insufficient drying. Subsequently, the remedies would be to properly dry the granules and using the right amount of lubrication. Too dry granules are also a cause for chipping where the tablets tend to chip under the pressure of the press, and the solution would be facilitating plasticity through moistening the granules. Moistening should involve the addition of hygroscopic substances to the granules. If there is excessive binding on the molding area, it is likely that the sides of a tablet crumble, which is in essence chipping. The remedy to excessive binding is the use of dry binders that optimize binding. Next in causes of chipping in the formulation of tablets are the causes related to the machining process. In the instance that a worn groove is present at the compression point of the die, there will be subjection of uneven compression that results in cracking at the tablet edges. Reversing or replacing the die would solve that problem, and also polishing makes another option to remedy worn die groove. A barreled die is one in which the center of the die tends to be wider than the ends, which could be a wear and tear problem. Just like the worn groove, a barreled die results in uneven compression and hence resulting in chipping. Making the die cylindrical through polishing takes care of the problem. The other two machining causes all alienate towards unequal pressure distribution on the surface of the tablet. Over time the edge of the punch may turn inward, and upon compression, chipping is likely to occur. To prevent chipping polishing the edges of the punch is usually a sufficient remedy. Also, the punch face may portray some degree of concavity making it impossible to compress properly. Use of flat punches eliminates the problem entirely, but also measures to try and reduce the concavity would help in the absence of flat punches. In conclusion causes and remedies of chipping in tablet revolve around formulation and machine settings. Wrong formulation and machine settings being the causes of the chipping, and the right formulation and machine settings being the remedies.